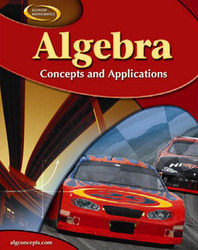 An ideal program for struggling students, Glencoe Algebra: Concepts and Applications covers all the Algebra 1 concepts. This program is designed for students who are challenged by high school mathematics. Help students obtain better understanding of algebra with the many detailed examples and clear and concise explanations located in each lesson. Help students obtain better understanding of algebra with the many detailed examples and clear and concise explanations located in each lesson. Build students’ confidence in completing assignments with Homework Help with Extra Practice. Increase students’ access for additional algebra help with Glencoe’s extensive online resources, including Self-Check Quizzes, Extra Examples, and Vocabulary Review aligned to their Glencoe Algebra: Concepts and Applications text.